You'll be £45.00 closer to your next £10.00 credit when you purchase Warships of the Napoleonic Era. What's this? Between 1793 and 1815 two decades of unrelenting naval warfare raised the sailing man of war to the zenith of its effectiveness as a weapon of war. Every significant seapower was involved in this conflict, and at some point virtually all of them were arrayed against Great Britain. A large number of enemy warships were captured in battle, making them of interest to British artists, engravers and printmakers, while the Admiralty ordered accurate draughts to be made of many of these prizes. Consequently, for this era the ships of all navies, not just British, can be illustrated by an unprecedented variety of paintings, drawings, models or plans.rnrnThis book reproduces many of the best (and least familiar) images of the ships, chosen for their accuracy, detail and sheer visual power in an extra-large format that does full justice to the images themselves. These are backed by an authoritative text that looks at how the ships were used by the different navies, and explains the function and development of the apparently bewildering array of rates and types. It is a book that anyone with an interest in wooden warships will find both enlightening and a pleasure to peruse. A masterpiece, very useful and interesting for lovers of ships and naval modellers. I happily confess to being a fan of Gardiner's work. 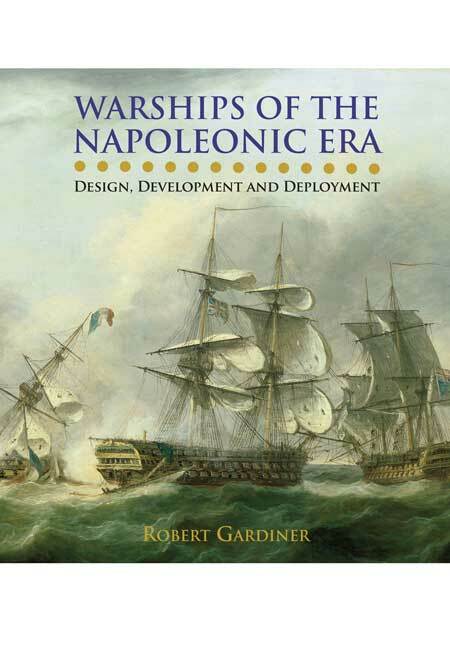 His 'Frigates of the Napoleonic Wars' is a favourite of mine. This book follows the same format, a little over twelve inches square, which allows for some stunning illustrations. The content covers ships of Britain, other European powers and the U.S.A although the bulk of the text is of the Royal Navy. The writing is fluid and most readable for both the person who wants it as a reference book and a cover to cover reader like me. All through one feels the authority of the author is based on thorough research, and, for anyone who wants to go further, there is an extensive list of sources. As an aside almost all of the line drawings would allow an experienced boat modeller to create precise replicas. This is a superb book which I cannot recommend too highly. Warships of the Napoleonic Era is a very attractive book as well as being absolutely sound in its descriptions and conclusions. The only problem; it's so big, where do you keep it? Beautifully illustrated. A worthwhile purchase for any naval historian during the Age of Sail or maritime libraries. This is a wonderful examination of the fighting ships that navigated the seas between 1793 and 1815, and the narrative and captions provide an ocean-full of interesting facts and details to complement the outstanding illustrations selected for the book.